"At college the teachers show you the easiest and best ways to do a job. They really help if you are struggling with something." 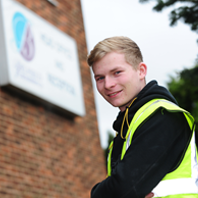 Teenager Lewis Cottle says switching direction to an apprenticeship course is helping to “set me up for life”. Richard Newby, HSE and maintenance manager at Belfield, said Lewis’s application was one of those which stood out and he was one of two candidates taken on. Lewis has now switched from a Level 1 Brickwork course to study towards a Level 2 Diploma in Maintenance. He is studying one day a week at college and learning the ropes with Belfield on the remaing four working days. He said: “At college the teachers show you the easiest and best ways to do a job. They really help if you are struggling with something. I like the job because it’s actually doing something real. If you do it, like a factory floor, it’s here for the next 30 years or more. It’s an achievement.